When I moved to the USA, one of the things that my mother and I agreed upon was that we would always visit each other. One year she’d visit, and the following year I’d visit Puerto Rico. Well the I, turned into an us. Married and with a child, now the visits every other year were not only a request but a must. It was important to me that our child know his heritage language, culture, and know his familia who lived far away. Little one surrounded by his aunties, uncles, cousins, and us in Puerto Rico. Communication using technology has been very helpful for us. We actually don’t Skype due to our busy schedules; but we often send short videos, and voice messages through smartphone apps. It’s a way to keep our child connected to his familia. Sending and receiving care packages, and good old regular snail mail in either English or Spanish has been a constant in our home. I have been blessed with an amazing long-distance family support system when it comes to raising a bilingual child. Often the care packages come with awesome materials and/or books in Spanish! Throughout the years, I’ve had the family visit us, and we’d visit them in Puerto Rico. 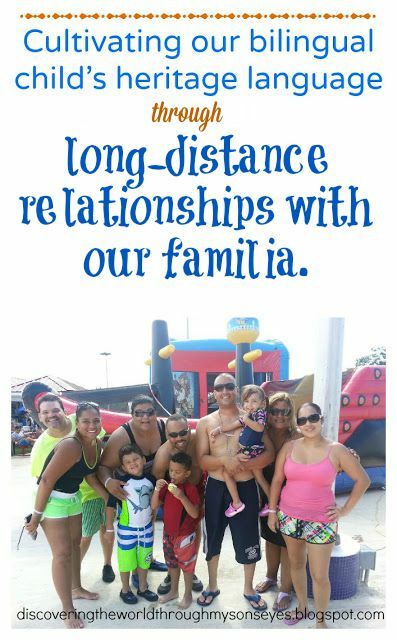 Although, our child sees his extended family a few times a year; he has a relationship with his Abuela, Tías, Tíos, and his primos. The best part is that he communicates with them in our heritage language Spanish! Ten years after I moved from Puerto Rico, I realize that long-distance has not hindered in any way our son’s love for his heritage language, culture, and extended familia. In part thanks to our awesome family!!! You guys rock!!! We love you! For more on our bilingual journey click here. This post has been created for inclusion in this Multilingual Carnival hosted by Rita from Multilingual Parenting.